About Giveet, we are focusing to design and develop lots of portable and practical products, gadgets, gifts and more. We always adhere to quality as our mission and offer the best service for our value customer! The Giveet J205 Bluetooth 4.1 Receiver offers a convenient and functional way to transform audio and hi-fi systems into wireless compatible ones. 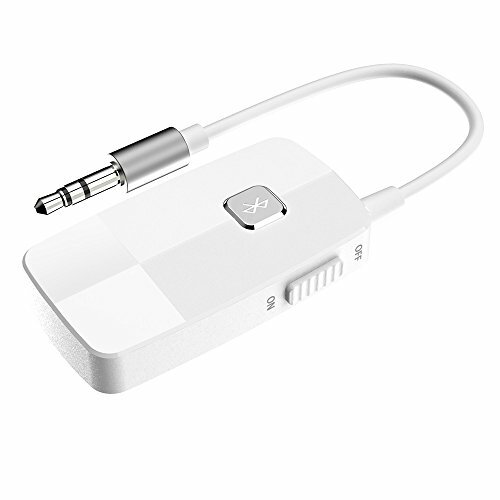 ◆ This little device can be connected to your wired headphones, speakers, home sound system, car stereo and other portable non-Bluetooth device by a 3.5mm or 2.5mm L/R audio cable. ◆ Enjoy your music freely from your phones, tablets and other Bluetooth devices. While charging, the item will be reset and power off.So if you want to use it, please re-turn on it again while charging and the item will be automatically connected to your paired device. 1) The Bluetooth Adapter is not Bluetooth transmitter, not for TV. 2) Please search Giveet Bluetooth Transmitter and they are on hot sales. 3) If need password, please enter 0000 (Four Zero). ◆ Advanced CSR Bluetooth V4.1 Chipset: Get Hi-Fi high quality audio sound in playing music and wide compatibility. Compatible with most Bluetooth enabled devices like smartphones, PC, Tablet, Laptop etc, ideal for home or vehicle stereo audio systems. Please note the Bluetooth Audio Receiver is not build in Mic and doesn't support hands-free calling. ◆ Easy to Use: Easy to set up and quickly connect to your Bluetooth device. Support automatically reconnect the paired devices quickly. ◆ Double Link: Connect two Bluetooth devices at once; freedom to enjoy music. Bluetooth range reaches up to 30 feet in open space without obstacles. ◆ Extra-Long Working Time: Built-in battery provides up to 14 hours' play, 400 hours' standby time, only takes 2 hours to fully charge it.And it can work even while charging. ◆ 100% Customer Satisfaction Guarantee: Love it Or Your Money Back without any reason within 30days, Full One Year Quality Warranty!